I have a problem. And this time of year it’s a bear to bare with: My sweet tooth. Those cute little ribbon things. Cinnamon Roasted Almonds...you know how they fill the mall with their smell and tug you toward them? Everywhere you turn there is something sweet to nibble on. Goodness, they even take things like fruit and cover it with chocolate or caramel or layers of both! And it seems my sweet tooth is never satisfied. The more I taste, the more I want. This is not helpful if I still want to fit in to my clothes come January 1st. So imagine my glee when I discovered something sweet I can gorge on day and night. Something that will always satisfy and is not harmful at all: the Word of the Lord. 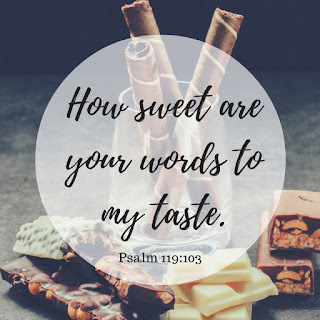 “How sweet are your words to my taste…” (Psalm 119:103). Strange, I know, to say words satisfy. That they are sweet. But spend some time talking with Him. Sit in His presence. Let it flow over you. Wrap you. Embrace you. And then start writing down the words you feel. I bet sweetness is on that list. See, there is a sweetness in the intimacy, in the abandonment of praising Him, in His all-consuming love. Is there really any better way to describe it? So today, while you’re baking, shopping, running, prepping…stop. Just for a moment. And wait on Him. Lift your hands and begin to praise Him. He truly is the sweetest thing.